I've been catching myself dancing in the kitchen. Al looked at me and asked if I was happy. I didn't think I was, but apparently my body is happy. It jumps and spins and shuffles through the kitchen, doing plies and demi-kicks and little leaps. I couldn't begin to tell you what this is about. This postcard is more of my muse's tiny strips, this time with a big white block in it. 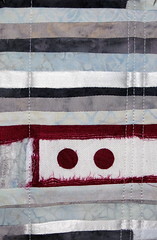 The part to the left of the block is vertical strips with the ragged edges showing, but it is hard to see in the photo. I had a great visit with two women after yoga today. One is new to me, one I found again after losing track of her for six months. It was very nice - tea, laughter, life stories... exactly what I wanted. Circus is daunting. I can climb, but I get worried about being too high and having my arms give out. I can do ugly straddles and splits, and a foot lock, but my strength to weight ratio is still not so good. I am working on both halves of that - decreasing weight, increasing strength - with what feels like limited success. And yet, I can do what I couldn't six months ago. Probably I need to take a longer view. Alice had the end Holiday Solstice concert for her school. The Montessori school is mostly a pre-school, with two smallish class rooms of grades 1-3 and 4-6. The concert had a range of songs mostly sung and shouted by tiny adorable children torn between waving to their parents and staring at all the rest of the strange adults in the room. They sang. They signed Twinkle. They brought down the house. The Upper El class sat primly at the back, taller than anyone else, with Alice in the middle singing where she knew the words, smiling gamely at the songs many kids had been singing for years. I was proud of her. Al and Aerin came and cheered her on too, just as I promised. That is what families do. When someone is competing or performing, the rest go along to cheer them on. It is part of the deal. Alice hadn't experienced this end of the deal much - I think she liked it.